This art book is a visual treat to Disgaea fans. It's a 192-page paperback filled with illustrations from all four Disgaea games, namely Disgaea: Hour of Darkness, Disgaea 2: Cursed Memories, Disgaea 3: Absence of Justice and Disgaea 4: A Promise Unforgotten. There are illustrations from all sorts of merchandise like game covers, books, soundtrack, other promotional materials and in-game illustrations as well. It's not a concept art book. The art is beautiful, printed in mixture of sizes from quarter page to full page. It's shonen manga style with very pastel colours throughout. The bulk of art comes from Takehito Harada (原田たけひと). However, there are many illustrations drawn by other artists who were not credited. The index page have info on where the art came from. The artist commentary appear for only three illustrations. This book is translated by Udon from the original Japanese edition 魔界戦記ディスガイア　公式イラストコレクション　:DISGAEArt!!! that was published in 2012. 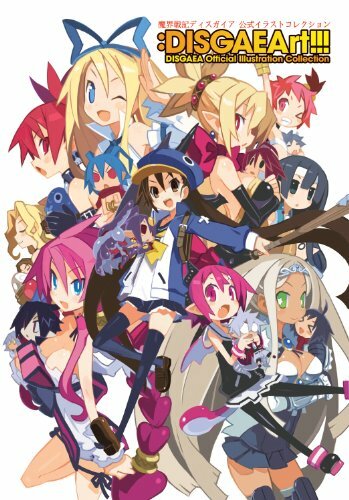 That book had mixed reviews, citing the lack of artist credits and duplication of work from other books such as Takehito Harada Art works I原田たけひと おしごとのーと and Disgaea 3 Official Design Works 魔界戦記ディスガイア3 公式設定資料集. If you don't have those books, then it's not a concern. If you like the Disgaea series and the style of art, this is a great buy. Why's there illustration's from other anime? Probably the one in the third photo lower right. It apears to be Index from To Haru Majutsu no Index. To answer the commenter above, there are characters from anime featured in Disgaea 4 because the creator is friends with the respective characters' artists :p So they're included as cameos when you perform special attacks in Disgaea 4.